With that said: he’s still a 4 year old preschooler. And moms, the struggle is real! I go a bit crazy sometimes when he wants to eat his ravioli fridge cold and refuses it to be heated up. Or when he insists on eating a cheese sandwich everyday for a week. Also, those times where he straight up refuses to try what we’ve served…frustrating! Thankfully, Stonyfield and OXO Tot have us covered. 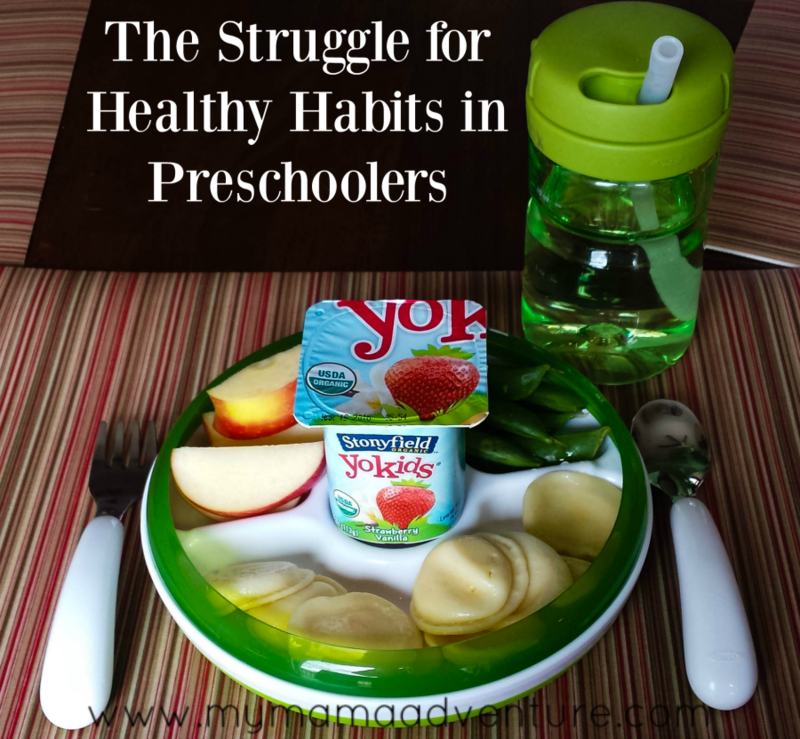 My son loves the Stonyfield Squeezers and the Stonyfield YoKids yogurts (Confession: I may sneak those squeezers in my own lunch sometimes). OXO Tot has all the feeding gear that you need for indulging all your little one’s eating “quirks.” M particularly likes the Divided Plate and the Twist Top Water Bottle. I particularly love the water bottle for his school bag. It doesn’t leak! It’s easy for him to twist the top to get it open. I am also especially partial to the Grape Cutter and Flippy Snack Cup. The snack cup seems much more durable than similar snack cups we’ve owned – which are long gone into a landfill somewhere because they just didn’t hold up to our particular tot. As for the baby…I am absolutely in love with the Baby Blocks Freezer Storage Containers. I don’t use them for freezing, I use them for those baby food pouches! Do I trust a 9 month old with a pouch? Nope! Not even a little. The storage containers are the perfect size for the pouches. And the Roll-Up Bib? Is quite possibly my favorite bib, now. The Velcro cinches in to a nice size for a small neck and it’s strong, so the rambunctious 9 month old can’t pull it off. It also does what it’s intended, and catches the dropped food. Okay, clearly, I’m a little obsessed over all the things OXO Tot. Seriously, how did I not discover it sooner! I’m beyond thrilled that there was a partnership with Stonyfield and OXO so that I had the opportunity to try the awesomeness.